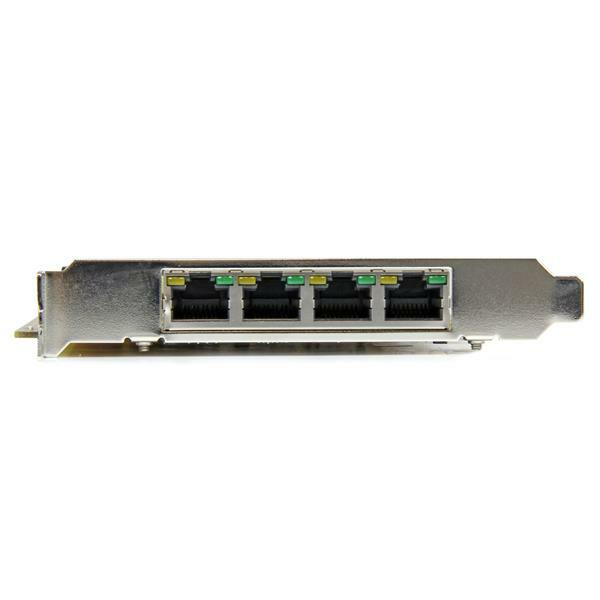 The ST4000PEXPSE 4-Port PoE NIC lets you add four Gigabit Power over Ethernet ports through a single PCI Express slot. Each port can provide up to 25.5W of power, combining network data and power over a single Ethernet cable for reduced cable clutter and added convenience for remote PoE devices. The PCI express PoE card supports the IEEE 802.3at (Type 1 and 2) standard for Power Sourcing Equipment (PSE), and can deliver up to 48V DC power to compliant Powered Devices (PD). This eliminates the need for a separate power source and data connection for PoE devices such as IP cameras, IP phones or wireless access points. Suitable for any standard profile PCIe-enabled client, server or workstation, the PoE network card supports features such as Jumbo Frames (up to 9KB), VLAN tagging and Wake on LAN (WoL). Patents and Licenses The following patents are licensed for this product. This list might not be all inclusive.